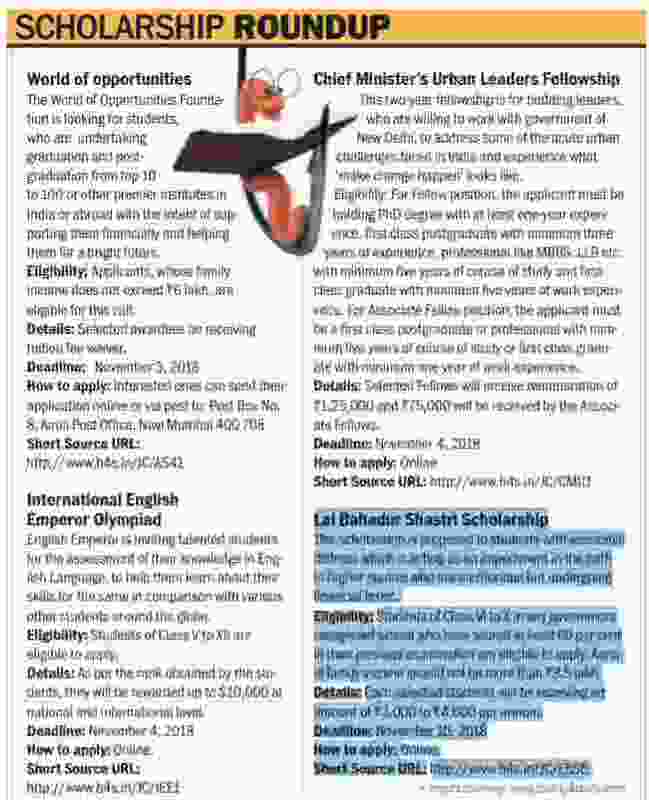 The World of Opportunities Foundation is looking for students, who are undertaking graduation and post graduation from top 10 to 100 or other premier institutes in India or abroad with the intent of supporting them financially and helping them for a bright future. Eligibility: Applicants, whose family income does not exceed ~6 lakh, are eligible for this call. Details: Selected awardees be receiving tuition fee waiver. English Emperor is inviting talented students for the assessment of their knowledge in English Language, to help them learn about their skills for the same in comparison with various other students around the globe. Eligibility: Students of Class V to XII are eligible to apply. Details: As per the rank obtained by the students, they will be rewarded up to $10,000 at national and international level. This two-year fellowship is for budding leaders, who are willing to work with government of New Delhi, to address some of the acute urban challenges faced in India and experience what 'make change happen' looks like. Eligibility: For Fellow position, the applicant must be holding PhD degree with at least one-year experience, first class postgraduate with minimum three years of experience, professional like MBBS, LLB etc. with minimum five years of course of study and first class graduate with minimum five years of work experience. For Associate Fellow position, the applicant must be a first class postgraduate or professional with minimum five years of course of study or first class graduate with minimum one year of work experience. Details: Selected Fellows will receive remuneration of ~1,25,000 and ~75,000 will be received by the Associate Fellows. 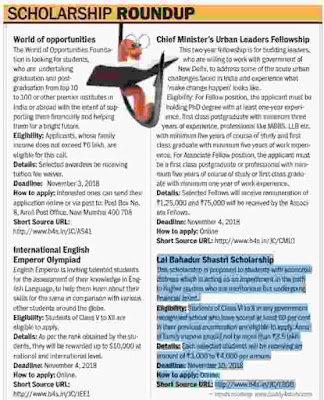 This scholarship is proposed to students with economic distress which is acting as an impediment in the path to higher studies who are meritorious but undergoing financial brunt. Eligibility: Students of Class VI to X in any government recognized school who have scored at least 60 per cent in their previous examination are eligible to apply. Annual family income should not be more than ~3.5 lakh. Details: Each selected students will be receiving an amount of ~3,000 to ~4,000 per annum.